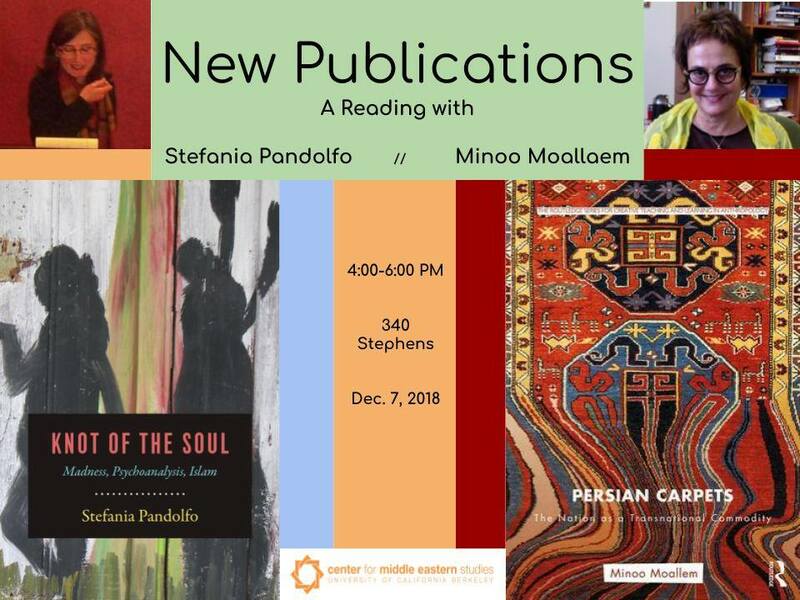 Please join the CMES for readings from two new publications by CMES affiliated faculty, Stefania Pandolfo (Anthropology) and Minoo Moallem (Gender and Women's Studies). Through a dual engagement with the unconscious in psychoanalysis and Islamic theological-medical reasoning, Stefania Pandolfos unsettling and innovative book reflects on the maladies of the soul at a time of tremendous global upheaval. Drawing on in-depth historical research and testimonies of contemporary patients and therapists in Morocco, "Knot of the Soul: Madness, Psychoanalysis, Islam" offers both an ethnographic journey through madness and contemporary formations of despair and a philosophical and theological exploration of the vicissitudes of the soul. In "Persian Carpets: the Nation As a Transnational Commodity" Moallem tracks the Persian carpet as an exotic and mythological object, as a commodity, and as an image from mid-nineteenth-century England to contemporary Iran and the Iranian diaspora. Using an innovative interdisciplinary and transnational feminist approach, Moallem follows the journey of this single commodity-which crosses the boundaries of private and public, religious and secular, cultural and economic, modern and traditional, national and diasporic- to tell the story of transnational interconnectivities in the making of informal imperialism and consumer capitalism. In a highly original theoretical move and through the study of the specific example of Persian carpets, Moallem brings representational practices into conversation with issues of labor, affects, and materiality.